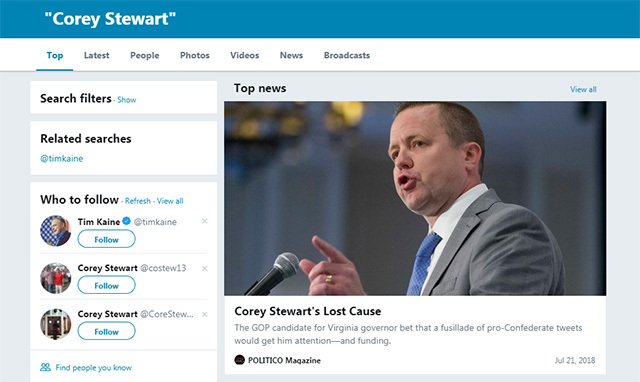 Virginia Republican Senate candidate Corey Stewart was trending on Saturday due to his debate with Democrat Senator Tim Kaine. I clicked the topic at around 12:30 PM, which was around an hour into the debate. What Twitter's algorithms decided to show was page after page of all negative comments, or at best neutral. The majority accused Stewart of being a racist, neo-nazi, white supremacist, white nationalist and so on. Twitter's engineers said they wanted to "ban a way of talking." At the very bottom of the screenshot, which is around 100 tweets down, you'll find one positive comment.